St Cecilia Chorus, Banstead Musical Society: Sing your heart out with us! Sing your heart out with us! Singing in a choir is good for you! So if you're thinking of reaping the benefits, why not join St Cecilia Chorus this year? 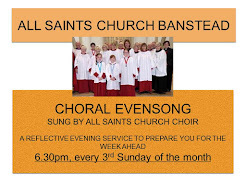 We're a well-established choir in Banstead ready to give you a warm welcome. We've just appointed a new music director too so its going to be an exciting year. This autumn we'll be rehearsing music by Handel, Schubert, Bach and Mendelssohn to perform with an orchestra and soloists on 11 November. Just come along on or call our secretary Judith on 0208 643 9924.